Everest Academy: Dec. 3, 2015 Hanceville: Haiku Contest & “Fleeting Pleasures: Japanese Wood Block Prints from the Georgia Museum of Art"
Dec. 3, 2015 Hanceville: Haiku Contest & “Fleeting Pleasures: Japanese Wood Block Prints from the Georgia Museum of Art"
HANCEVILLE, Ala. — The Evelyn Burrow Museum at Wallace State Community College is pleased to present “Fleeting Pleasures: Japanese Wood Block Prints from the Georgia Museum of Art" through December 3. Drawing from the outstanding collection of works on paper at the Georgia Museum of Art, this exhibition will provide a history and overview of Japanese woodblock prints or ukiyo-e, literally, pictures of the floating or fleeting world. As their name suggests, these landscapes, cityscapes and scenes of domestic life were intended to emphasize the impermanence and fleeting beauty of the world around us. Ukiyo-e prints first arose in Tokyo during the Edo period (1603­1868) and later served as a vital source for European modern artists. As multiples, their mass production made them more affordable than paintings and added to their popularity, though many original prints are now quite rare and sought after. Their varied subjects provide nuanced insights into Japanese Edo culture, and their bright colors and decorative style have long captivated viewers. This exhibition includes a number of works by Utagawa Hiroshige (1797­-1858) and Katsushika Hokusai (1760­1849), two of the most famous Japanese printmakers. It also features other prominent ukiyo-e artists, including Hishikawa Morunobu (1618­-1694), who is generally considered to have pioneered the technique with his single-color prints from the 1670s, and Suzuki Harunobu (1724­-1770), who developed the polychrome, multi-block printing process that characterizes the style. In addition, several members of the community have loaned Japanese objects and artworks to display with the exhibition. Visitors will see antique kimonos, elaborate obi, porcelain and ceremonial table wares and objects, dolls an antique tansu chest and other artworks. The Evelyn Burrow Museum is grateful to Doris Boyd, Richard and Melissa Folsom Boyen, Cheiko Fujimoto, June Jones, Tamara Moriya of the Japanese American Society of Alabama, Kazue Shichinohe, Alice St. John, Narumi St. John, and Ritchie Teichmiller for their loans of art and expertise to this exhibition. The Wallace State English Department, Sigma Kappa Delta English honor society, and The Lion’s Den Writing Club will host a haiku poetry contest during the exhibition. Haiku is a descriptive form of poetry originating in Japan structured in only three lines totaling 17 syllables. The first and third lines are five syllables, and the second line is seven syllables. A haiku does not have to rhyme and can be about any subject matter. The contest is open to all Wallace State students and the public. Entries will be accepted through Dec. 3, and should be submitted to Jen Hays, English Department, P.O. Box 2000, Hanceville, AL, 35077. Prizes for first ($150), second ($100) and third ($50) places will be awarded. The winning haiku will be published on the Wallace State website and in other appropriate publications. Call 256.352.8219 for more information. The Museum also has the National Watercolor Society’s 95th Annual International Exhibition on exhibition through October. For more information about the Burrow Museum, visit burrowmuseum.org, or contact the Museum by phone at 256.352.8457 or email at burrowmuseum@wallacestate.edu. The Great Wave Off Kanagawa (from the series “Thirty-Six Views of Mt. 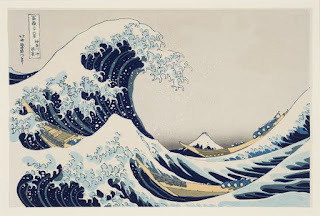 Fuji”), 1829–32, by Katsushika Hokusai. Nihonbashi Bridge in the Rain (from the series Famous Places in the Eastern Capital), 1832, by Utagawa Hiroshige.